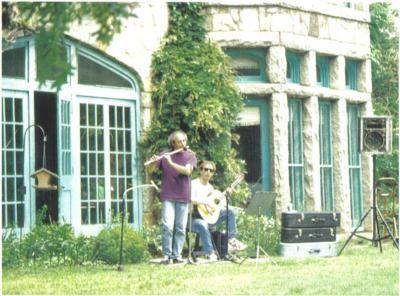 Steve plays flute, alto flute, bass flute, piccolo, wooden flutes, and recorders, while Audie plays classical guitar, steel-string guitar, twelve-string guitar, electric guitar, and laud. They usually perform as a duo but when appropriate they add other musicians and perform as a larger ensemble. They are enthusiastic about accomodating special requests, and by using carefully selected microphones and a highly accurate sound system, they are able to amplify their instruments in a natural and beautiful manner, creating a pleasant sound which can be heard throughout the entire room without overpowering it. 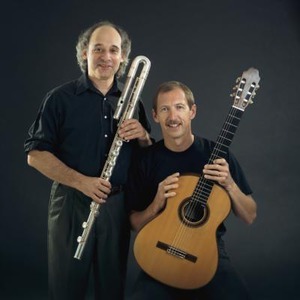 Steve Tapper and Audie Bridges have released three recordings ("Island Dance", "Simple Gifts" and "Shalom Aleichem”) that have received national airplay and international sales. Please note Steve Tapper & Audie Bridges Flute & Guitar Duo will also travel to Stoneham, Melrose, Reading, Woburn, Lynnfield, Malden, Saugus, Lynn, North Reading, Peabody, Winchester, Burlington, Everett, Medford, Revere, West Medford, Wilmington, Arlington, Boston, Chelsea, Danvers, Hathorne, Middleton, Somerville, Arlington Heights, Cambridge, Lexington, Pinehurst, Salem, Swampscott.